Teacher Training Program Coming Soon! Looking for a program to grow in your yoga practice or maybe your aspiring to become a certified yoga instructor? Grow and succeed your goals with our teacher training program. We are launching our dynamic 200-hour Teacher Training Program. Further information about the program will be posted. This summer is a time not only for reflection, but for action. Putting those goals into perspective! Everyone needs to be proactive in their steps toward their goals to better health or fitness routine. Jump start your yoga practice on a international day that celebrates the art of yoga! Join us in celebrating International Yoga Day on June 21 as hundreds and millions will gather in celebration of this day. Several poses and types of yoga will be explored on this day. This will truly be a day of yoga that will be celebrated around the world. During this day find yourself completing your own private practice or scheduling a private session with an instructor to help you deepen within your yoga journey. This is also a great time to share the day with nature for open-air yoga at your local park or outside in the backyard. Celebrate your inner yogi on this day, but try to embrace your yoga journey each day of the calendar year! After all it’s time to take action and begin or deepen in your yoga practice! Winter time is a time of reflection. Truly this time of the season yogis can reflect on refining or starting a yoga practice. By reflecting on your yoga practice, it will help to improve your daily goals to reach flexibility , balance, strength and relaxation. I always think of the winter time as not just a time to wrap in a blanket, but a true time of reflection. After all, when you reflect you are able to build or transform-and that is what yoga is all about! 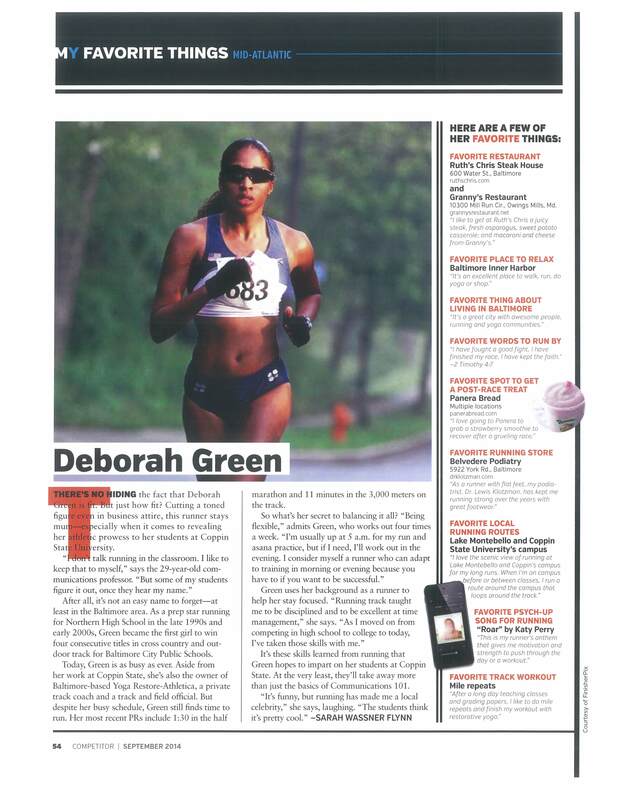 Congratulations to yoga instructor and runner Deborah Green who was featured in the September 2014 issue of Competitor Magazine. The article details Green’s ways of managing work and detailing workouts that include yoga and running. Developing a personal yoga practice outside of your daily routine of traveling to your scheduled yoga session may improve your confidence, self-esteem and development as a practitioner of yoga. A personal practice has several benefits to toward your mind, body and spirit. Your personal practice could be just making 10 to 20 minutes of a routine yoga salutations in the morning, afternoon or night before bed. Giving yourself personal time with self as you meditate on the breath and body through carefully constructed asana practice is just the starting point of reaching one’s path. Start your personal practice by deciding a time and place for your practice. You might want to practice in the morning, afternoon or evening. Next think about your environment- practicing at home, gym or some pictureque place to help you concentrate on your goals and objectives. Maybe you enjoy more of an open-air concept. Whatever the case might be reviewing postures to incorporate into your sequencing will lead you on a strong path in your personal practice.